This practice consists of two parts. The first part focuses on tag questions (all tenses and intonation). The second part is a practice of passive sentences. Students are given the same sentence in different tenses so that they discover the difference on meaning and form of each. The present downloadable printable is meant for high school students at Pre-intermediate (A2) level. 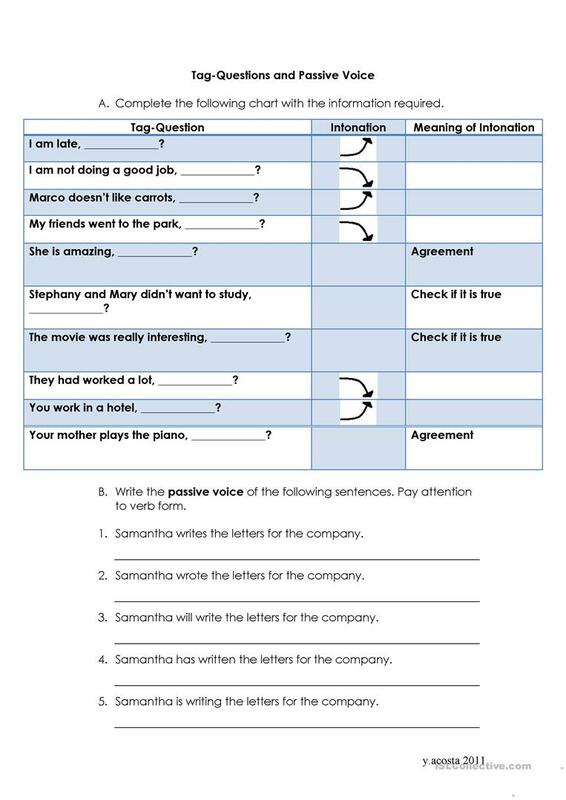 It is great for consolidating Question tags in English, and was designed for honing your learners' Writing skills. aniyeri is from/lives in Costa Rica and has been a member of iSLCollective since 2011-08-17 04:55:50. aniyeri last logged in on 2018-11-19 21:12:23, and has shared 1 resources on iSLCollective so far.